Network services are the programs that users interact with directly in their daily work. They are the tip of the information system iceberg, and this chapter focuses on them; the hidden parts they rely on are the infrastructure we already described. Many modern network services require encryption technology to operate reliably and securely, especially when used on the public Internet. X.509 Certificates (which may also be referred to as SSL Certificates or TLS Certificates) are frequently used for this purpose. A certificate for a specific domain can often be shared between more than one of the services discussed in this chapter. The Falcot Corp administrators selected Postfix for the electronic mail server, due to its reliability and its ease of configuration. Indeed, its design enforces that each task is implemented in a process with the minimum set of required permissions, which is a great mitigation measure against security problems. Debian uses Exim4 as the default email server (which is why the initial installation includes Exim4). The configuration is provided by a separate package, exim4-config, and automatically customized based on the answers to a set of Debconf questions very similar to the questions asked by the postfix package. The configuration can be either in one single file (/etc/exim4/exim4.conf.template) or split across a number of configuration snippets stored under /etc/exim4/conf.d/. In both cases, the files are used by update-exim4.conf as templates to generate /var/lib/exim4/config.autogenerated. The latter is the file used by Exim4. Thanks to this mechanism, values obtained through Exim's debconf configuration — which are stored in /etc/exim4/update-exim4.conf.conf — can be injected in Exim's configuration file, even when the administrator or another package has altered the default Exim configuration. The Exim4 configuration file syntax has its peculiarities and its learning curve; however, once these peculiarities are understood, Exim4 is a very complete and powerful email server, as evidenced by the tens of pages of documentation. 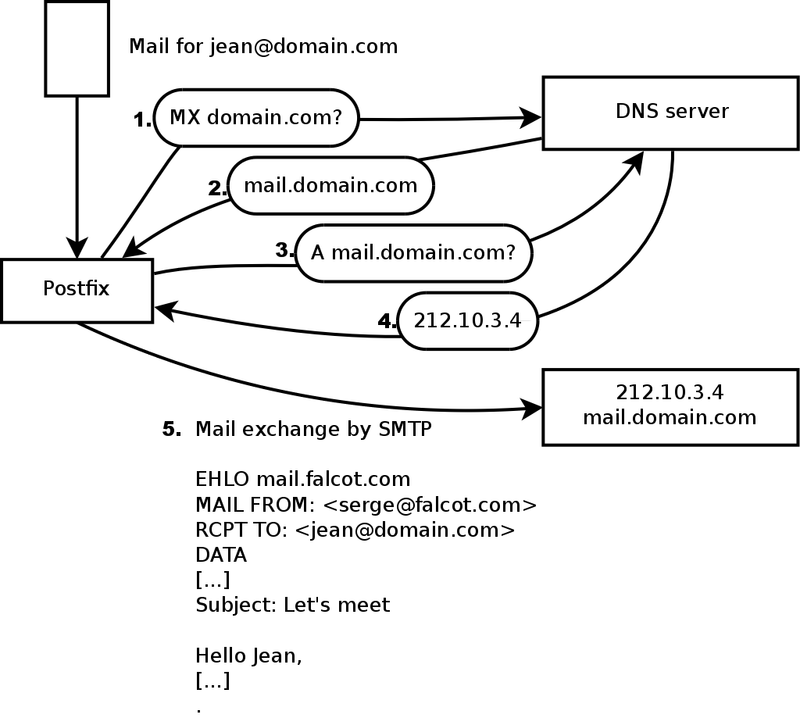 The postfix package includes the main SMTP daemon. Other packages (such as postfix-ldap and postfix-pgsql) add extra functionality to Postfix, including access to mapping databases. You should only install them if you know that you need them. SMTP (Simple Mail Transfer Protocol) is the protocol used by mail servers to exchange and route emails. Several Debconf questions are asked during the installation of the package. The answers allow generating a first version of the /etc/postfix/main.cf configuration file. The first question deals with the type of setup. Only two of the proposed answers are relevant in case of an Internet-connected server, “Internet site” and “Internet with smarthost”. The former is appropriate for a server that receives incoming email and sends outgoing email directly to its recipients, and is therefore well-adapted to the Falcot Corp case. The latter is appropriate for a server receiving incoming email normally, but that sends outgoing email through an intermediate SMTP server — the “smarthost” — rather than directly to the recipient's server. This is mostly useful for individuals with a dynamic IP address, since many email servers reject messages coming straight from such an IP address. In this case, the smarthost will usually be the ISP's SMTP server, which is always configured to accept email coming from the ISP's customers and forward it appropriately. This setup (with a smarthost) is also relevant for servers that are not permanently connected to the internet, since it avoids having to manage a queue of undeliverable messages that need to be retried later. ISP is the acronym for “Internet Service Provider”. It covers an entity, often a commercial company, that provides Internet connections and the associated basic services (email, news and so on). The second question deals with the full name of the machine, used to generate email addresses from a local user name; the full name of the machine ends up as the part after the at-sign (“@”). In the case of Falcot, the answer should be mail.falcot.com. This is the only question asked by default, but the configuration it leads to is not complete enough for the needs of Falcot, which is why the administrators run dpkg-reconfigure postfix so as to be able to customize more parameters. One of the extra questions asks for all the domain names related to this machine. The default list includes its full name as well as a few synonyms for localhost, but the main falcot.com domain needs to be added by hand. More generally, this question should usually be answered with all the domain names for which this machine should serve as an MX server; in other words, all the domain names for which the DNS says that this machine will accept email. This information ends up in the mydestination variable of the main Postfix configuration file — /etc/postfix/main.cf. When the DNS does not have an MX record for a domain, the email server will try sending the messages to the host itself, by using the matching A record (or AAAA in IPv6). In some cases, the installation can also ask what networks should be allowed to send email via the machine. In its default configuration, Postfix only accepts emails coming from the machine itself; the local network will usually be added. The Falcot Corp administrators added 192.168.0.0/16 to the default answer. If the question is not asked, the relevant variable in the configuration file is mynetworks, as seen in the example below. Local email can also be delivered through procmail. This tool allows users to sort their incoming email according to rules stored in their ~/.procmailrc file. After this first step, the administrators got the following configuration file; it will be used as a starting point for adding some extra functionality in the next sections. The snake oil certificates, like the snake oil “medicine” sold by unscrupulous quacks in old times, have absolutely no value: you cannot rely on them to authenticate the server since they are automatically generated self-signed certificates. However they are useful to improve the privacy of the exchanges. In general they should only be used for testing purposes, and normal service must use real certificates; these can be generated with the procedure described in Section 10.2.1.1, “Public Key Infrastructure: easy-rsa”. The mail server can receive emails addressed to other domains besides the main domain; these are then known as virtual domains. In most cases where this happens, the emails are not ultimately destined to local users. Postfix provides two interesting features for handling virtual domains. None of the virtual domains must be referenced in the mydestination variable; this variable only contains the names of the “canonical” domains directly associated to the machine and its local users. A virtual alias domain only contains aliases, i.e. addresses that only forward emails to other addresses. Such a domain is enabled by adding its name to the virtual_alias_domains variable, and referencing an address mapping file in the virtual_alias_maps variable. The /etc/postfix/virtual file describes a mapping with a rather straightforward syntax: each line contains two fields separated by whitespace; the first field is the alias name, the second field is a list of email addresses where it redirects. The special @domain.com syntax covers all remaining aliases in a domain. # the falcotsbrand.com domain not otherwise covered by this file. Postfix does not allow using the same domain in both virtual_alias_domains and virtual_mailbox_domains. However, every domain of virtual_mailbox_domains is implicitly included in virtual_alias_domains, which makes it possible to mix aliases and mailboxes within a virtual domain. Messages addressed to a virtual mailbox domain are stored in mailboxes not assigned to a local system user. Enabling a virtual mailbox domain requires naming this domain in the virtual_mailbox_domains variable, and referencing a mailbox mapping file in virtual_mailbox_maps. The virtual_mailbox_base parameter contains the directory under which the mailboxes will be stored. The virtual_uid_maps parameter (respectively virtual_gid_maps) references the file containing the mapping between the email address and the system user (respectively group) that “owns” the corresponding mailbox. To get all mailboxes owned by the same owner/group, the static:5000 syntax assigns a fixed UID/GID (of value 5000 here). Again, the syntax of the /etc/postfix/vmailbox file is quite straightforward: two fields separated with whitespace. The first field is an email address within one of the virtual domains, and the second field is the location of the associated mailbox (relative to the directory specified in virtual_mailbox_base). If the mailbox name ends with a slash (/), the emails will be stored in the maildir format; otherwise, the traditional mbox format will be used. The maildir format uses a whole directory to store a mailbox, each individual message being stored in a separate file. In the mbox format, on the other hand, the whole mailbox is stored in one file, and each line starting with “From ” (From followed by a space) signals the start of a new message. The growing number of unsolicited bulk emails (spam) requires being increasingly strict when deciding which emails a server should accept. This section presents some of the strategies included in Postfix. “Spam” is a generic term used to designate all the unsolicited commercial emails (also known as UCEs) that flood our electronic mailboxes; the unscrupulous individuals sending them are known as spammers. They care little about the nuisance they cause, since sending an email costs very little, and only a very small percentage of recipients need to be attracted by the offers for the spamming operation to make more money than it costs. The process is mostly automated, and any email address made public (for instance, on a web forum, or on the archives of a mailing list, or on a blog, and so on) will be discovered by the spammers' robots, and subjected to a never-ending stream of unsolicited messages. All system administrators try to face this nuisance with spam filters, but of course spammers keep adjusting to try to work around these filters. Some even rent networks of machines compromised by a worm from various crime syndicates. Recent statistics estimate that up to 95% of all emails circulating on the Internet are spam! The smtpd_client_restrictions directive controls which machines are allowed to communicate with the email server. When a variable contains a list of rules, as in the example above, these rules are evaluated in order, from the first to the last. Each rule can accept the message, reject it, or leave the decision to a following rule. As a consequence, order matters, and simply switching two rules can lead to a widely different behavior. The permit_mynetworks directive, used as the first rule, accepts all emails coming from a machine in the local network (as defined by the mynetworks configuration variable). The second directive would normally reject emails coming from machines without a completely valid DNS configuration. Such a valid configuration means that the IP address can be resolved to a name, and that this name, in turn, resolves to the IP address. This restriction is often too strict, since many email servers do not have a reverse DNS for their IP address. This explains why the Falcot administrators prepended the warn_if_reject modifier to the reject_unknown_client directive: this modifier turns the rejection into a simple warning recorded in the logs. The administrators can then keep an eye on the number of messages that would be rejected if the rule were actually enforced, and make an informed decision later if they wish to enable such enforcement. The restriction criteria include administrator-modifiable tables listing combinations of senders, IP addresses, and allowed or forbidden hostnames. These tables can be created from an uncompressed copy of the /usr/share/doc/postfix-doc/examples/access.gz file. This model is self-documented in its comments, which means each table describes its own syntax. The /etc/postfix/access_clientip table lists IP addresses and networks; /etc/postfix/access_helo lists domain names; /etc/postfix/access_sender contains sender email addresses. All these files need to be turned into hash-tables (a format optimized for fast access) after each change, with the postmap /etc/postfix/file command. The third directive allows the administrator to set up a blacklist and a whitelist of email servers, stored in the /etc/postfix/access_clientip file. Servers in the whitelist are considered as trusted, and the emails coming from there therefore do not go through the following filtering rules. The last two rules reject any message coming from a server listed in one of the indicated blacklists. RBL is an acronym for Remote Black List; there are several such lists, but they all list badly configured servers that spammers use to relay their emails, as well as unexpected mail relays such as machines infected with worms or viruses. Blacklists sometimes include a legitimate server that has been suffering an incident. In these situations, all emails coming from one of these servers would be rejected unless the server is listed in a whitelist defined by /etc/postfix/access_clientip. Prudence therefore recommends including in the whitelist all the trusted servers from which many emails are usually received. Each SMTP exchange starts with a HELO (or EHLO) command, followed by the name of the sending email server; checking the validity of this name can be interesting. The first permit_mynetworks directive allows all machines on the local network to introduce themselves freely. This is important, because some email programs do not respect this part of the SMTP protocol adequately enough, and they can introduce themselves with nonsensical names. The reject_invalid_hostname rule rejects emails when the EHLO announce lists a syntactically incorrect hostname. The reject_non_fqdn_hostname rule rejects messages when the announced hostname is not a fully-qualified domain name (including a domain name as well as a host name). The reject_unknown_hostname rule rejects messages if the announced name does not exist in the DNS. Since this last rule unfortunately leads to too many rejections, the administrators turned its effect to a simple warning with the warn_if_reject modifier as a first step; they may decide to remove this modifier at a later stage, after auditing the results of this rule. Using permit_mynetworks as the first rule has an interesting side effect: the following rules only apply to hosts outside the local network. This allows blacklisting all hosts that announce themselves as part of the falcot.com, for instance by adding a falcot.com REJECT You are not in our network! line to the /etc/postfix/access_helo file. Every message has a sender, announced by the MAIL FROM command of the SMTP protocol; again, this information can be validated in several different ways. The /etc/postfix/access_sender table maps some special treatment to some senders. This usually means listing some senders into a white list or a black list. The reject_unknown_sender_domain rule requires a valid sender domain, since it is needed for a valid address. The reject_unlisted_sender rule rejects local senders if the address does not exist; this prevents emails from being sent from an invalid address in the falcot.com domain, and messages emanating from joe.bloggs@falcot.com are only accepted if such an address really exists. Finally, the reject_non_fqdn_sender rule rejects emails purporting to come from addresses without a fully-qualified domain name. In practice, this means rejecting emails coming from user@machine: the address must be announced as either user@machine.example.com or user@example.com. Each email has at least one recipient, announced with the RCPT TO command in the SMTP protocol. These addresses also warrant validation, even if that may be less relevant than the checks made on the sender address. reject_unauth_destination is the basic rule that requires outside messages to be addressed to us; messages sent to an address not served by this server are rejected. Without this rule, a server becomes an open relay that allows spammers to send unsolicited emails; this rule is therefore mandatory, and it will be best included near the beginning of the list, so that no other rules may authorize the message before its destination has been checked. The reject_unlisted_recipient rule rejects messages sent to non-existing local users, which makes sense. Finally, the reject_non_fqdn_recipient rule rejects non-fully-qualified addresses; this makes it impossible to send an email to jean or jean@machine, and requires using the full address instead, such as jean@machine.falcot.com or jean@falcot.com. The DATA command of SMTP is emitted before the contents of the message. It doesn't provide any information per se, apart from announcing what comes next. It can still be subjected to checks. The reject_unauth_pipelining directives causes the message to be rejected if the sending party sends a command before the reply to the previous command has been sent. This guards against a common optimization used by spammer robots, since they usually don't care a fig about replies and only focus on sending as many emails as possible in as short a time as possible. Although the above commands validate information at various stages of the SMTP exchange, Postfix only sends the actual rejection as a reply to the RCPT TO command. This means that even if the message is rejected due to an invalid EHLO command, Postfix knows the sender and the recipient when announcing the rejection. It can then log a more explicit message than it could if the transaction had been interrupted from the start. In addition, a number of SMTP clients do not expect failures on the early SMTP commands, and these clients will be less disturbed by this late rejection. A final advantage to this choice is that the rules can accumulate information during the various stages of the SMTP exchange; this allows defining more fine-grained permissions, such as rejecting a non-local connection if it announces itself with a local sender. The validation and restriction system would not be complete without a way to apply checks to the message contents. Postfix differentiates the checks applying to the email headers from those applying to the email body. Both files contain a list of regular expressions (commonly known as regexps or regexes) and associated actions to be triggered when the email headers (or body) match the expression. The /usr/share/doc/postfix-doc/examples/header_checks.gz file contains many explanatory comments and can be used as a starting point for creating the /etc/postfix/header_checks and /etc/postfix/body_checks files. The regular expression term (shortened to regexp or regex) references a generic notation for expressing a description of the contents and/or structure of a string of characters. Certain special characters allow defining alternatives (for instance, foo|bar matches either “foo” or “bar”), sets of allowed characters (for instance, [0-9] means any digit, and . — a dot — means any character), quantifications (s? matches either s or the empty string, in other words 0 or 1 occurrence of s; s+ matches one or more consecutive s characters; and so on). Parentheses allow grouping search results. The precise syntax of these expressions varies across the tools using them, but the basic features are similar. The first one checks the header mentioning the email software; if GOTO Sarbacane (a bulk email software) is found, the message is rejected. The second expression controls the message subject; if it mentions a virus notification, we can decide not to reject the message but to discard it immediately instead. Using these filters is a double-edged sword, because it is easy to make the rules too generic and to lose legitimate emails as a consequence. In these cases, not only the messages will be lost, but their senders will get unwanted (and annoying) error messages. “Greylisting” is a filtering technique according to which a message is initially rejected with a temporary error code, and only accepted on a further try after some delay. This filtering is particularly efficient against spam sent by the many machines infected by worms and viruses, since this software rarely acts as a full SMTP agent (by checking the error code and retrying failed messages later), especially since many of the harvested addresses are really invalid and retrying would only mean losing time. Postfix doesn't provide greylisting natively, but there is a feature by which the decision to accept or reject a given message can be delegated to an external program. The postgrey package contains just such a program, designed to interface with this access policy delegation service. Each time Postfix reaches this rule in the ruleset, it will connect to the postgrey daemon and send it information concerning the relevant message. On its side, Postgrey considers the IP address/sender/recipient triplet and checks in its database whether that same triplet has been seen recently. If so, Postgrey replies that the message should be accepted; if not, the reply indicates that the message should be temporarily rejected, and the triplet gets recorded in the database. The main disadvantage of greylisting is that legitimate messages get delayed, which is not always acceptable. It also increases the burden on servers that send many legitimate emails. Theoretically, greylisting should only delay the first mail from a given sender to a given recipient, and the typical delay is in the order of minutes. Reality, however, can differ slightly. Some large ISPs use clusters of SMTP servers, and when a message is initially rejected, the server that retries the transmission may not be the same as the initial one. When that happens, the second server gets a temporary error message due to greylisting too, and so on; it may take several hours until transmission is attempted by a server that has already been involved, since SMTP servers usually increase the delay between retries at each failure. As a consequence, the incoming IP address may vary in time even for a single sender. But it goes further: even the sender address can change. For instance, many mailing-list servers encode extra information in the sender address so as to be able to handle error messages (known as bounces). Each new message sent to a mailing-list may then need to go through greylisting, which means it has to be stored (temporarily) on the sender's server. For very large mailing-lists (with tens of thousands of subscribers), this can soon become a problem. To mitigate these drawbacks, Postgrey manages a whitelist of such sites, and messages emanating from them are immediately accepted without going through greylisting. This list can easily be adapted to local needs, since it is stored in the /etc/postgrey/whitelist_clients file. The drawbacks of greylisting can be mitigated by only using greylisting on the subset of clients that are already considered as probable sources of spam (because they are listed in a DNS blacklist). This is not possible with postgrey but milter-greylist can be used in such a way. In that scenario, since DNS blacklists never triggers a definitive rejection, it becomes reasonable to use aggressive blacklists, including those listing all dynamic IP addresses from ISP clients (such as pbl.spamhaus.org or dul.dnsbl.sorbs.net). Since milter-greylist uses Sendmail's milter interface, the postfix side of its configuration is limited to “smtpd_milters = unix:/var/run/milter-greylist/milter-greylist.sock”. The greylist.conf(5) manual page documents /etc/milter-greylist/greylist.conf and the numerous ways to configure milter-greylist. You will also have to edit /etc/default/milter-greylist to actually enable the service. Section 11.1.3, “Restrictions for Receiving and Sending” and Section 11.1.4, “Setting Up greylisting” reviewed many of the possible restrictions. They all have their use in limiting the amount of received spam, but they also all have their drawbacks. It is therefore more and more common to customize the set of filters depending on the recipient. At Falcot Corp, greylisting is interesting for most users, but it hinders the work of some users who need low latency in their emails (such as the technical support service). Similarly, the commercial service sometimes has problems receiving emails from some Asian providers who may be listed in blacklists; this service asked for a non-filtered address so as to be able to correspond. Postfix provides such a customization of filters with a “restriction class” concept. The classes are declared in the smtpd_restriction_classes parameter, and defined the same way as smtpd_recipient_restrictions. The check_recipient_access directive then defines a table mapping a given recipient to the appropriate set of restrictions. The many viruses circulating as attachments to emails make it important to set up an antivirus at the entry point of the company network, since despite an awareness campaign, some users will still open attachments from obviously shady messages. The Falcot administrators selected clamav for their free antivirus. The main package is clamav, but they also installed a few extra packages such as arj, unzoo, unrar and lha, since they are required for the antivirus to analyze attachments archived in one of these formats. The task of interfacing between antivirus and the email server goes to clamav-milter. A milter (short for mail filter) is a filtering program specially designed to interface with email servers. A milter uses a standard application programming interface (API) that provides much better performance than filters external to the email servers. Milters were initially introduced by Sendmail, but Postfix soon followed suit. The spamass-milter package provides a milter based on SpamAssassin, the famous unsolicited email detector. It can be used to flag messages as probable spams (by adding an extra header) and/or to reject the messages altogether if their “spamminess” score goes beyond a given threshold. Once the clamav-milter package is installed, the milter should be reconfigured to run on a TCP port rather than on the default named socket. This can be achieved with dpkg-reconfigure clamav-milter. When prompted for the “Communication interface with Sendmail”, answer “inet:10002@127.0.0.1”. The reason why we use a real TCP port rather than the named socket is that the postfix daemons often run chrooted and do not have access to the directory hosting the named socket. You could also decide to keep using a named socket and pick a location within the chroot (/var/spool/postfix/). The standard ClamAV configuration fits most situations, but some important parameters can still be customized with dpkg-reconfigure clamav-base. If the antivirus causes problems, this line can be commented out, and service postfix reload should be run so that this change is taken into account. This file is not a true virus, but a test file that all antivirus software on the market diagnose as a virus to allow checking installations. All messages handled by Postfix now go through the antivirus filter. Being able to send emails requires an SMTP server to be reachable; it also requires said SMTP server to send emails through it. For roaming users, this may need regularly changing the configuration of the SMTP client, since Falcot's SMTP server rejects messages coming from IP addresses apparently not belonging to the company. Two solutions exist: either the roaming user installs an SMTP server on their computer, or they still use the company server with some means of authenticating as an employee. The former solution is not recommended since the computer won't be permanently connected, and it won't be able to retry sending messages in case of problems; we will focus on the latter solution. SMTP authentication in Postfix relies on SASL (Simple Authentication and Security Layer). It requires installing the libsasl2-modules and sasl2-bin packages, then registering a password in the SASL database for each user that needs authenticating on the SMTP server. This is done with the saslpasswd2 command, which takes several parameters. The -u option defines the authentication domain, which must match the smtpd_sasl_local_domain parameter in the Postfix configuration. The -c option allows creating a user, and -f allows specifying the file to use if the SASL database needs to be stored at a different location than the default (/etc/sasldb2). Note that the SASL database was created in Postfix's directory. In order to ensure consistency, we also turn /etc/sasldb2 into a symbolic link pointing at the database used by Postfix, with the ln -sf /var/spool/postfix/etc/sasldb2 /etc/sasldb2 command. Now we need to configure Postfix to use SASL. First the postfix user needs to be added to the sasl group, so that it can access the SASL account database. A few new parameters are also needed to enable SASL, and the smtpd_recipient_restrictions parameter needs to be configured to allow SASL-authenticated clients to send emails freely. As for all Postfix maps, this file must be turned into /etc/postfix/sasl_passwd.db with the postmap command.